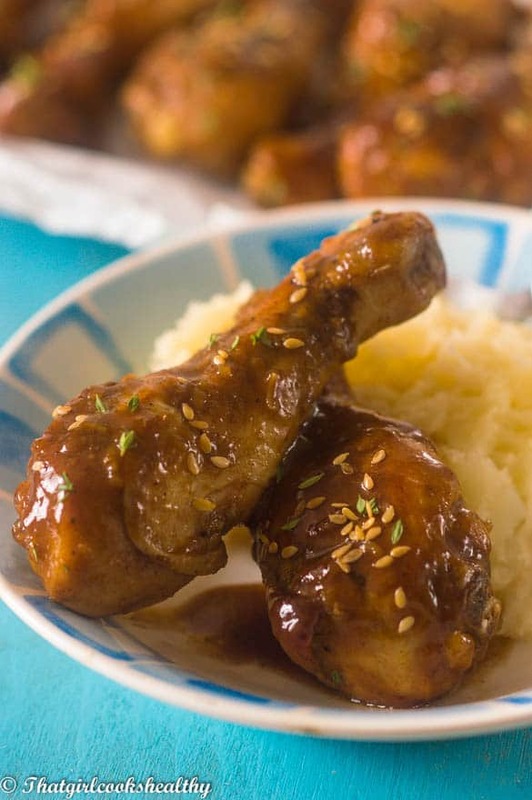 Sticky chicken drumsticks infused with a generously amount of nutmeg for the Caribbean flare. The perfect way to impress your family with this tropical recipe on a busy week night. If you’re looking for a chicken recipe packed with flavour, tasty and relatively easy to prepare then you have come to the right place. 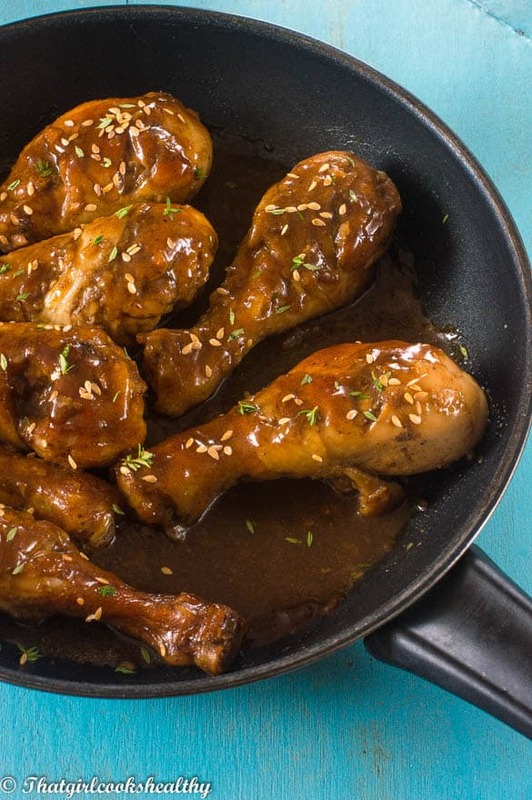 The ingredients used to season the chicken are commonly found in your pantry, especially if you’re a health enthusiast who adores coconut sugar. If you have been following my blog from the beginning you will already know that I am the queen of substituting unhealthy for the more healthy ingredients where possible especially if it has a low glycemic index, which is a major concern for diabetics and/or people inflicted with high blood pressure. These measures are very important and I try to go that extra mile to cater to the aforementioned needs. 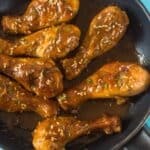 There are so many sticky chicken drumsticks recipes out there it’s quite overwhelming. Each blogger has their own spin and methodology on how to prep their’s. You should try goggling it sometime, you’ll be amazed at how each foodie whips up their own signature style chicken. I’m a lady who loves well seasoned chicken, probably the Island blood in me, if it’s bland I won’t eat it -flavour diva, yup! On that note, you would already have guessed that the chicken was left to marinate overnight. I highly recommend leaving the marinate to penetrate the chicken for a long as possible. Overnight is preferred, but if you are pushed for time several hours is suffice, just don’t skip this step. From as long as I can remember the women in my family would ALWAYS leave the meat to infuse the seasoning/marinate for at least several hours. Of course there are exceptions to the rule but as a general rule of thumb that was the standard norm. The marinade once prepared and cooled is separated into two batches – one third of the marinade is to infuse the chicken and the remaining portion of the liquid marinade is reserved to make the thick lovely sauce that you can see in the picture. I roasted the chicken in the oven after it had been marinated to assist with searing the meat without the use of oil. Of course it is a lot quicker to brown the chicken in the pan, but I’m trying to opt for the healthy fat free route so bear with me. The next step is pretty much smooth sailing, just transfer the chicken into a frying pan with the leftover batch of nutmeg marinade, bring to the boil, baste the chicken as the marinade boils (you will notice the marinade thickening resulting in a nice chicken stew). Just leave the chicken to cook for further 10-15 minutes and serve, easy as that! Pour the warm water along with the rest of the ingredients (excluding the thyme) into a small saucepan and bring to the boil. Once the mixture has boil reduce to a simmer and continue to stir until it begins to thicken. Once mixture has thicken, set aside to cool completely (very important). 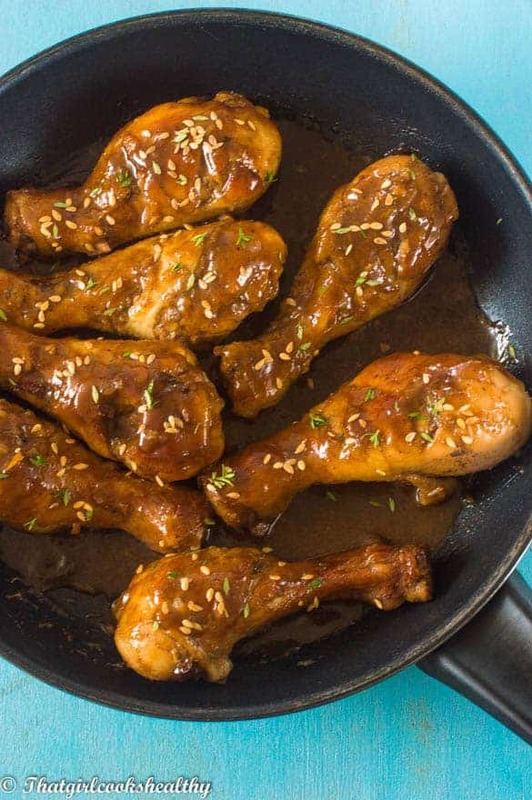 Use a knife to create 2 diagonal slashes to each side of the drumsticks and then place the entire batch in a ziplock (or double bag and knot) a bag with 1/3 cup of the nutmeg marinade. 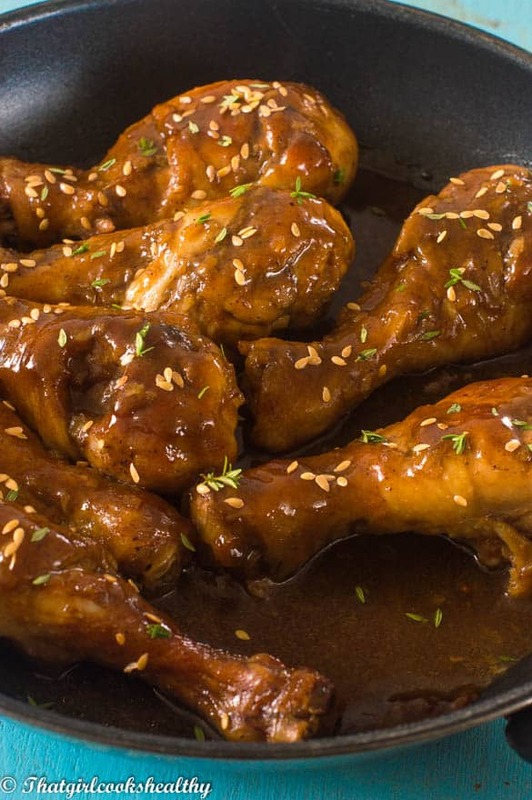 Allow the marinade to infuse the chicken in the refrigerator overnight or for several hours. Carefully remove the drumsticks from the bag and place onto a baking dish. Discard the bag with marinade. Roast the chicken for 20-25minutes, turning frequently so each side with is somewhat brown. Pour the remainder of the marinade and add the sprigs of thyme to a large frying pan and then bring to the boil. Tilt the pan to the side and proceed to baste the chicken with a spoon for 2 minutes. Reduce the heat, cover the pan with a lid and simmer for 10-15 minutes – during this marinade will thicken creating a lovely thicken stew. You can baste the chicken throughout this time to add more color and depth to the chicken. Oh my the spices on these sound delicious! I’m guessing the tapioca starch does a similar job to corn starch? Thanks Brian, yes the tapioca starch is to aid thickening, paleo preferred! Loving all the flavours in this, and that it is on the healthy side! Perfect alternative to bbq chicken. That sauce sounds amazing – so many delicious flavours in it. I bet it would go really well with tofu too. Yes, tofu would be a really good substitute. Love the seasoning you used in this recipe! Looks mouthwatering! Hi again, Charla! Earlier this week, my kind host mentioned how much he loves Jamaican cuisine. So, I decided to test your Sticky Chicken Drumsticks recipe on him. 🙂 Although I couldn’t find tapioca starch or onion granules – I just made do with Corn Starch and used a small onion instead – your recipe ROCKED! My host and I enjoyed it immensely. I served it with garlic – ginger mashed potatoes and sauteed carrots. Next time, I’m going to pair it with your delish rice & peas recipe (and hopefully fried plantains). Thanks again for sharing so generously your amazing recipes with the world. Please keep me posted when your cookbook will be released. Enjoy your weekend and keep well.